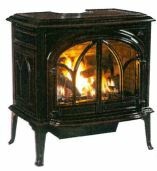 Jøtul's often imitated open door fire viewing feature has been designed into the Jøtul GF 200 DV II Lillehammer. 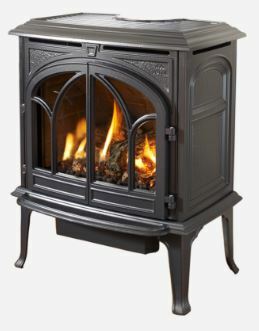 Incorporating Jøtul's new revolutionary cast iron and stainless steel burner, the JøtulBurner™, the Jøtul GF 200 DV II Lillehammer is the perfect stove for your bedroom...or any other room in your home. Beauty and efficient operation come alive within the Jøtul GF 400 BV Sebago. Handsomely detailed in cast iron, this stove's nautical styling recalls the coves and shores of Lake Sebago, locked amid the rock and pines of Maine. Incorporating Jøtul's new revolutionary cast iron and stainless steel burner, the JøtulBurner™, and Jøtul Heat Fin™ technology makes the Jøtul GF 400 BV Sebago the perfect medium size heater for any home. Modern design with an elegant three-sided fire view, the Jøtul GF 370 DV utilizes the new JøtulBurner III to create an exceptional fire view from any angle. Based on the award winning Jøtul F 370 wood stove, the Jøtul GF 370 DV offers the same contemporary cast iron styling in a freestanding direct vent stove. Loaded with standard features including accent lighting, variable speed blower and energy saving ignition system, the Jøtul GF 370 DV is the perfect combination of design and craftmanship. 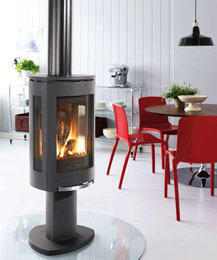 The Jøtul F 370 Concept has received a number of design awards such as the Norwegian “Award for Design Excellence”. In addition the Jøtul F 373 has won the prestigious “red dot award – best of the best“. 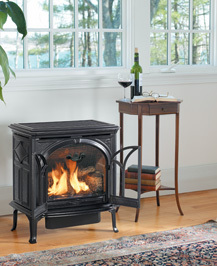 The new Jøtul GF 300 BV Allagash version 2 presents the perfect union of efficiency and beauty. Fueled by the quiet durability of our revolutionary new cast iron and stainless steel burner - the JøtulBurner ™ , this stove is created to endure. Incorporating Jøtul Heat Fin ™ technology for optimum heat exchange and with a 50% heat turn down capability, the Jøtul GF 300 DV/BV Allagash fulfills the heat requirements of a variety of living spaces. Options include: Antique brick panel kit, wall thermostat, remote control, floor bracket kit (for mobile home installations), screen for open door fire viewing, variable speed blower fan kit, leg leveler kit and short leg kit. 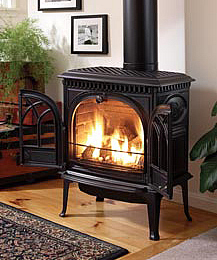 A descendant of our signature best-selling Jøtul F 500 Oslo wood stove, the Jotul GF 500 DV Portland offers the same whole house heating capabilities at the push of a button. fueled by the new ceramic JøtulBurner™ III the Jøtul 500 presents the perfect union of high efficiency and timeless cast iron design.